Red Box to Valley Forge track map from November 2016 using Backcountry Navigator (US Forest Service-2013 map) from my phone. Route description with trail segment pages: From Red Box, follow the Gabrieleno Trail to Valley Forge. 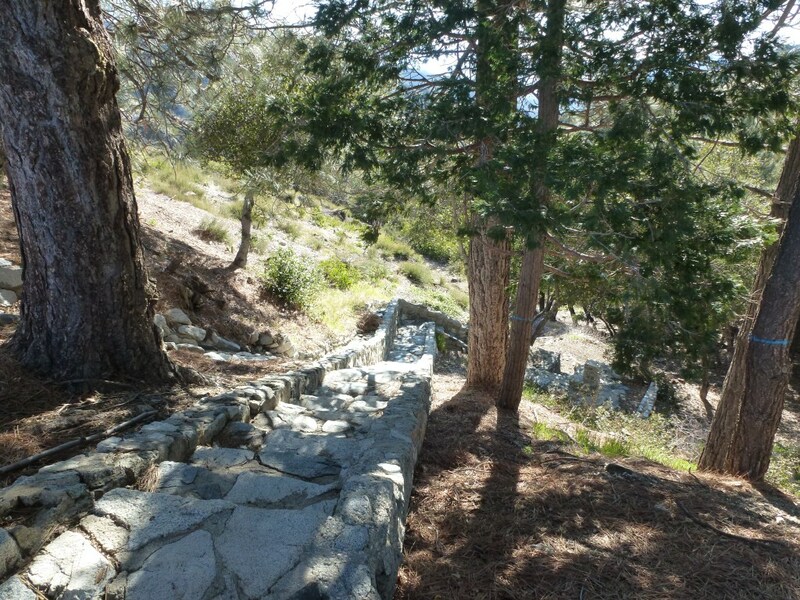 View of San Gabriel River at one of the river crossings along the Gabrieleno Trail. My boyfriend and I just hiked this 2/13/16-2/15/16. Your instructions were incredibly helpful, especially the pictures! The hike in seemed a lot longer than an hour and a half. Stream water was flowing pretty well and was icy cold. Weather was good and there was no issue finding wood for fire. Hike out passed in a flash. Thanks for letting me know about your hike. It’s great to know you had a nice trip and that my blog was helpful. I just found your site and I am very happy I found it! I just did a little overnight with my six year old son and found this to be a nice hike. Water in the stream was flowing well enough to filter. There was a couple of groups here, but plenty of room to set up a site. Your photos make finding the trail and the way so easy! I created a PDF of your page re: this hike and saved it to my phone. It made life so easy. Thank you very much. Mike, you’re welcome. It’s great to hear you found my site helpful and that you had a nice trip with your son. I see you last hiked this on 2/5/2015. How much water was in the streams? There was less water than usual but still enough to filter. However, it’s rained/snowed a couple times since then, so hopefully there’s more now than I saw then. Thank you! Great blog and thanks for the information! Great hike! Campground is really nice and spacious. Look for the little wooden bridge for even more spaces! Some gnats and mosquitos, so bring bug repellant if they bother you, but we were fine without it. There was plenty of water throughout the hike on 6/11/13. Also lots of flowers. Make sure you check out the Gabrieleno Trail 7 trail segment link on this page as the directions and pictures there were a huge help. Thanks to the page owner for making such an awesome guide! The best we’ve found!!! You’re welcome and thanks for posting a report on your visit! Hiked this one yesterday, although I guess I’d forgotten that there was a campground eentually so we didn’t go quite that far – I’m guessing we came up maybe half a mile short. But its a lovely little jaunt and there were indeed many places with running water (great for the hound) and the flowers were also beautiful. Plenty ‘o poison ok, that’s for sure! Saw a deer and one small coiled rattlesnake. The dog thankfully noticed neither. Thanks for the report! Nice to have the water availability confirmed. Great to hear you enjoyed it. Indeed it does, Kyle. Saw you hiked it a month ago… do you suppose there’s still water in the crik? We did about 3/4 of the route you recommended yesterday, from Dawson Saddle. Went past Throop Peak but my friend didn’t think she could make it all the way to the top of Baden-Powell so we stopped along the way and had lunch. I ask about water because the dog ended up drinking 3/4 of our supply! So if there was available canine H2O that would be a plus. 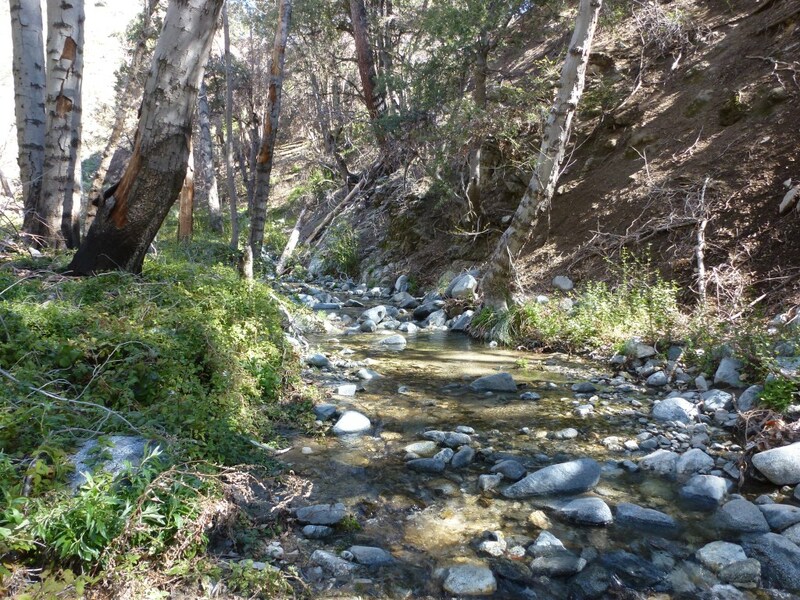 Yes, there should still be water in the San Gabriel River along this portion of the trail. More as you get closer to Valley Forge. I know for sure there was a lot of water flowing last year in August a little further up the trail at West Fork. I hope you enjoyed yesterday’s trek. We went Saturday.